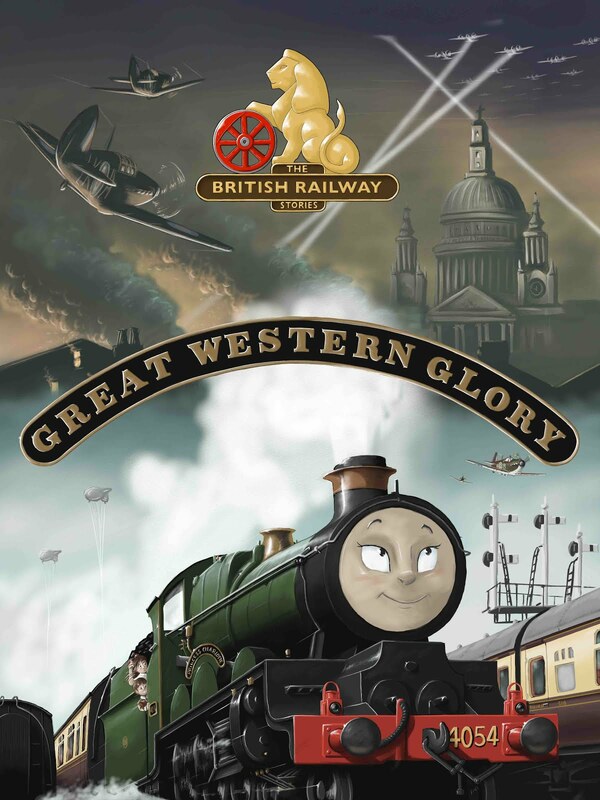 THE BRITISH RAILWAY STORIES LTD: "Nitpicky - Simon's Response"
Some of you may be aware that on occasion I do some blogs for my good friend at the Sodor Island Forums, Ryan Hagan. I actually did a review of The Adventure Begins for him recently and you can find that blog here. Some of you may also be aware that overnight there was a "review of a review". Bit of a strange concept to me, being reviewed for my reviews...! You can read that piece here. But hey, it's a free country and we're all allowed a right of reply, so here's mine. One of the things that was brought up was railway realism. Unless you have actually done some research into Awdry's work, you wouldn't necessarily understand how much historical writing went into his stories. The Real Lives of Thomas the Tank Engine has a fantastic database with almost all of the original stories and their origins covered, here. 1) Engines don't have faces. No they do not. Excellent spot that. However Awdry used these faces to make the engine characters more understandable to children. Emotions are very difficult things to establish without visual aids in children's writing, especially for the early years. This does not mean that Awdry's stories weren't also complex, steeped in railway history, and in accordance with railway practices of the time. They were: so the idea that slapping faces on trains means it in any way invalidates the above is a straw man argument. Aside from the fact there is the perfectly good website which shows that all of the above were possible (here's that link again to emphasise this) and in fact in some cases have several historical precedents, I have to stand up for Awdry's "Wrong Road" story in particular and say that actually, I've found several examples where Awdry's work was spot on historically. The most likely one Awdry would have been aware of in my opinion was an incident on the L & NWR. Though the locomotive concerned wasn't so big as a Gresley Pacific, the L & NWR Claughton locomotives were the biggest on the railway at that time, with a high axle loading and yes - there would have been many people in the permanent way department concerned at a very heavy locomotive traversing a more lightly loaded branchlike! So the criticisms of Awdry's work here come from a lack of knowledge about the source material. That's okay, not everyone can know everything, but trust me when I say that Awdry's work has both historical basis in fact and also railway practice at the forefront of the writing. Well yes, that is sort of the point. These stories form a sort of partial reboot, a new starting point from which further new specials could emerge in this vein. So what exactly is your point here? These stories aren't aimed at people such as the reviewer of my review, or me. They're aimed at the newest and youngest generations. That doesn't also mean they can't be excellent pieces that take from the original source material and follow them carefully, updating them for a modern audience in a very positive way. I cited Winnie the Pooh as the best example in my review, and there are other examples of both adult and children's literature where they've been updated well for the modern day and bring a real flavour of the author's original intentions to the fore. And yes, you can get closer and closer to the original style of the author with careful understanding and writing. Look at the "new" James Bond books that have been released by different authors in the last decade. They're not perfect Ian Fleming-a-likes but they are extremely close and very entertaining. 4) All it screams, to me, is a purist screaming "THIS ISN'T WHAT I WANTED!". Er - what? I say on countless occasions within my own review that this is exactly what I wanted. So...? No, it didn't live up to my own high expectations (and I say this explicitly too) but I also counter this with being positive about the special and pointing out that it is still by far the best special HiT Entertainment have produced under that brand. It's a positive step in the right direction (and I say this too). I'm not going to apologise for lamenting certain things, and that it's still a flawed production. That's kind of the point: if it was perfect I'd say so. Yes I have high standards and I apply that to my life, my writing, my modelling, my day job, relationships and similar. That's not a bad thing. If your standards don't come up to mine, that's your hang up and not something I would criticise you for. If you enjoy it, by all means, enjoy it. In this case I did enjoy the special and my godson will too, but I'm not going to shy away from being honest. At the end of the day the "review of a review" with a hastily tagged on disclaimer at the end seems to me to be nothing more than the writings of someone who both didn't understand the source material, and certainly didn't read my review very carefully, sounding off because he seems to think the review is attacking HiT Entertainment's production. It isn't - it hasn't - and though I lament some of the things missed out and perhaps not done as well as they could have been, that's surely the point of a review? It is my opinion after all. You don't have to agree with it, but you could check to see if your own facts are right before throwing something out onto the internet both attacking my character and the intentions of my review (and I have to say, the disclaimer at the end is hilarious. The whole review is an attack on me and my character and yet there's this disclaimer, tagged on at the end, like some sort of "get out of jail" clause. I know where I stand on this, frankly. It's not a great excuse and having thought about it overnight, decided to put my own view out there. This is separate to Ryan's work and has been done without consulting him, because quite frankly this review of a review was aimed at me, not Sodor Island Forums. The biggest problem with that particular fandom is that anyone who knows anything about anything is derided. People with knowledge get slapped down for being rivet counters, effectively. It's a nasty undercurrent prevalent not just in that fandom but others too. Perhaps this is a worldwide trend. People like the reviewer above forget how much of a positive contribution to the fandom the Sodor Island Forums have been. Ryan Hagan in particular has worked tirelessly to keep the Awdry name alive and without his influence and patience, you'd not see any improvements in the TV series at all. Hell, without blowing my own trumpet, I know my reviews have had some effect over the last decade because - guess what - there's brake vans on trains again at last...! (I had to slip that in somewhere). All I know is that where I'm asked for my views, I will continue to give them, with all the information I have at my disposal and with the unerring honesty of someone with ultimately good principles and a determination to make things better for everyone. You bring up some very good point and, indeed, my response was rather off the cuff, rushed and poorly researched. I personally don't mind if things stray slightly from the source material, but there are fans that would rather things bee 100% grounded. Different opinions, as you've said. Why I didn't post my thoughts about the review on the review's comments, I don't really know. Probably fear, more than anything, about the reaction. But I should have known that the way I went about it would have made things worse in the long run. So I can definitely see where you're coming from now, and there are lessons to be learned from, this whole... thing, by me mostly. I personally saw it as a rather... negative review, but I thank you for setting me straight and making me realise that's not the case. I agree: everyone cares about the final product. That's why we're fans at the end of the day. Thank you for your magnanimous reply. My issue with The Adventure Begins isn't that it's bad. It isn't, it's by far the bets of the specials. But it had the potential to be epic. As it stands I am disappointed, having set a very high bar to begin with. But that's not a bad thing and if they continue in the vein they are going they'll do very well in future.